Marketing isn’t hard. It’s simply knowing what your market wants and giving exactly that back to them. The amount of money you can make is directly correlated to how well you know the inner desires of your audience. And often their deepest wants are hidden. Sure, they may say they want x, y, and z (for example, “I want to lose 10 pounds, I want to make more money, I want to find a mate). But to really understand your audience you need to uncover the emotion behind the surface desire. There’s always a deeper motivation that drives us to buy things. 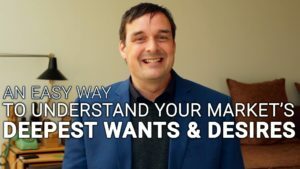 This week’s video is a simple and clever way to dig behind the surface of what your ideal client wants and really see and feel why they want to buy from you. Now it’s your turn! What insights did you get from this metaphor and how these three questions show up in your business. Share your comments below.